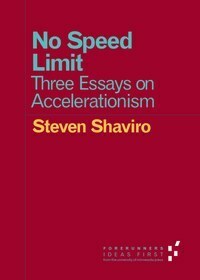 [...] accelerationism is best defined--in political, aesthetic, and philosophical terms--as the argument that the only way out is through. In order to overcome globalized neoliberal capitalism, we need to drain it to the dregs, push it to its most extreme point, follow it into its furthest and strangest consequences. As Bertolt Brecht put it years ago, "Don't start from the good old things but the bad new ones." The hope is that, by exacerbating our current conditions of existence, we will finally be able to make them explode, and thereby move beyond them. [...] science fiction as a genre does not claim to actually predict the future. Rather, it works to extrapolate elements of the present, to consider what these elements might lead to if allowed to reach their full potential. That is to say, science fiction is not about the actual future but about the futurity that haunts the present. It grasps, and brings to visibility, what Deleuze calls the virtual dimension of existence, or what Marx calls tendential processes. Science fiction takes up certain implicit conditions of our personal and social lives, and makes these conditions fully explicit in narrative. It picks out "futuristic" trends that are already embedded within our actual social and technological situation. These trends are not literal matters of fact, but they really exist as tendencies or potentialities. In the words of Deleuze, they are "real without being actual, ideal without being abstract, and symbolic without being fictional." They are potentials for change, growth, or decay, bu they have not fully expressed themselves or done all that they can do. And they may not ever do so, since (as Marx points out) a tendency is always accompanied by "counteracting factors" that can inhibit or even reverse it. The extraction, by banks and other large corporations, of a surplus from all social activities: not only from production (as in the classical Marxist model of capitalism) but from circulation and consumption as well. Capital accumulation proceeds not only by direct exploitation but also by rent-seeking, by debt collection, and by outright expropriation ("primitive accumulation"). What lurks behind this analysis is the frustrating sense of an impasse. Among its other accomplishments, neoliberal capitalism has also robbed us of the future. For it turns everything into an eternal present. The highest values of our society--as preached in the business schools--are novelty, innovation, and creativity. And yet these always only result in more of the same [...] as Ernst Block once put it, in a state of "sheer aimless infinity and incessant changeability; where everything ought to be constantly new, everything remains just as it was." But Hayek's market utopia does not take Keynesian uncertainty into account. Since we cannot quantify the future in probabilistic terms, it cannot be captured in terms of the "information" provided by the price system. Despite its supposedly self-correcting mechanisms, the "market" is as subject to unanticipated consequences and inefficient, disequilibrating outcomes as any planning mechanism would be. We should therefore reject the entire dichotomy between central planning, on the one hand, and market "rationality" on the other. Neither mechanism is guaranteed to produce desirable (or efficient) outcomes; neither is likely to reach any sort of equilibrium; both are subject to shocks and ruptures that cannot be contained within probabilistic calculations of risk. And yet, none of these contradictions have caused the system to collapse or have even remotely menaced its expanded reproduction. As Deleuze and Guattari say, "no one has ever died from contradictions". Instead, capitalism perpetuates itself through a continual series of readjustments. Despite the fact that we have reached a point where capitalist property relations have become an onerous "fetter upon the mode of production" that they initially helped to put into motion, this fetter shows no sign of being lifted. [...] The "capitalist integument" has failed to "burst asunder"; instead, it has calcified into a rigid carapace, well-nigh suffocating the life within. Capitalism has to transform plenitude into scarcity, because it cannot endure its own abundance. Again and again, as Marx and Engels say in the Manifesto, under capitalism "there breaks out an epidemic that, in all earlier epochs, would have seemed an absurdity--the epidemic of over-production". The wealth that capitalism actually produces undermines the scarcity that remains its raison d'etre. For once scarcity has been overcome, there is nothing left to drive competition. The imperative to expand and intensity production simply becomes absurd. In the face of abundance, therefore, capitalism needs to generate an imposed scarcity, simply in order to keep itself going. Accelerationism is best understood as a response to this strange dilemma. [...] capitalism has already provided us with the conditions for universal abundance. We no longer need to wait for some distant future: because, as William Gibson famously put it, "the future is already here--it's just not very evenly distributed."